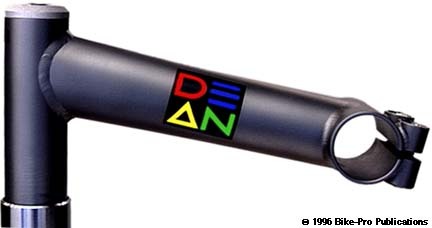 Dean USA has a reputation for selling the lightest bike parts humanly possible, to ridiculously high specifications, their stem, made for them by Clark Kent, is no exception. 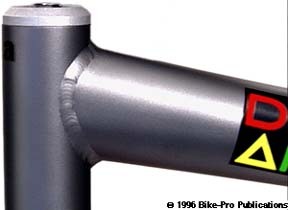 The stem is made from Titanium 3Al-2.5V tubing. The quill has a 1.4mm thick tubing wall. The extension is made of ovalized tubing, broader in the vertical at the quill, and broader in the horizontal at the binder tube. The three tubing pieces are TIG welded together with such meticulously fine pulsed welds, it looks as though they were polished afterward, but they haven't been. There are small holes drilled into the binder and quill tubes, which face into the extension at time of welding to relieve heat and stress build up during welding. The binder tube is made of tubing with a 1.48mm wall thickness. 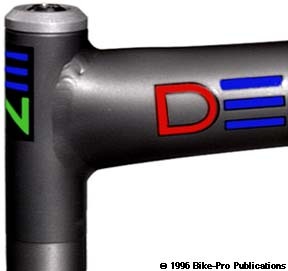 The Dean stem uses two binder bolts. The binder fittings are machined from Titanium rod which has been drilled and tapped to recess the bolt head flush and provide threads for the binder bolts. The back of the binder fitting is given a half round shape so it lays with full contact against the binder tube as it's welded in place. After welding the binder tube and installed fittings are sawn across the front to create the binder cinch system. At the top of the quill is a machined aluminum cap piece. Turned from aluminum rod, it's then drilled to recess the expander bolt head. The wedge is made in Taiwan of extrused aluminum with light machining to clean up and tap the threads. The expander bolt is made of Titanium 6Al-4V with 8mm by 1.25mm thread pitch. 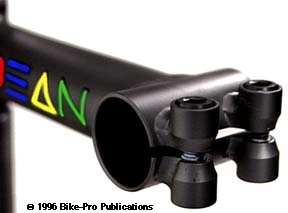 The bolt has a 6mm allen head, is 130mm long and weighs 26.5 grams. The binder bolts are also made of Ti 6-4 rod. Though it isn't generally a good policy to thread Titanium bolts into Titanium threads, Dean has their bolts "Tiodized" which is an infusion process that surfaces the Titanium material with a Teflon-like coating. The binder bolts have a 5mm allen head, with 6mm by 1mm thread pitch, are 20mm long and weigh 3.5 grams each. The Dean Mountain stem comes in 1", or 1 1/8" diameters with extension lengths of 130mm, or 145mm. The stem is available in a 0 degree rise and have a 25.4mm inner binder tube diameter. The weight of a 1" diameter Dean Mountain stem with a 0 degree rise in a 130mm extension is 192 grams, a 1 1/8" diameter with a 0 degree rise in a 130mm extension is 201.5 grams. The Dean Road model is made using the same tubing, binder fittings, quill cap, expander bolt, wedge and binder bolt. The Dean Road model uses a single binder to hold the handlebar within its 26.0mm diameter binder tube. The Road model is made in a minus 10 degree "rise" in a 1" diameter only. It is made in six lengths, 90mm, 100mm, 110mm, 120mm, or 130mm.